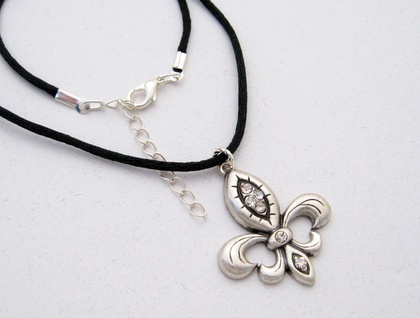 This necklace features a silver fleur-de-lys pendant, with fine detailing, set with six clear, sparkling rhinestones. It is suspended on a length of satiny black cord, which is finished with a silver-plated lobster-claw clasp and a silver plated extension chain. All other parts - including the cord ends and the little twisted ring from which the pendant hangs - are also silver plated. The pendant itself is a beauty. It is not silver plated, but has a muted silver tone; not bright and shiny, but not matte either; just softly gleaming. The details of the design are picked out in black. It is comfortable to wear: solid metal, but not too heavy. This necklace is a one-off design, never to be repeated. 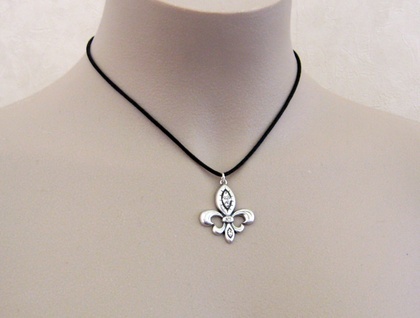 'Fleur-De-Lys Argent' means 'silver lily-flower' in French. 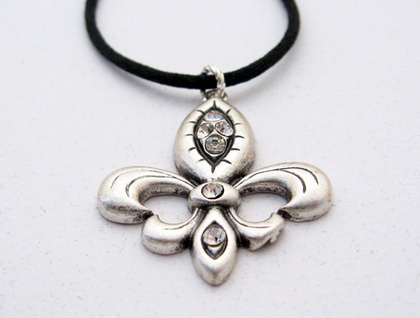 The fleur-de-lys or fleur-de-lis (literally 'flower of the lily') is a heraldic symbol: a stylised lily consisting of three petals bound together at their bases. Its graceful shape is featured on the former royal arms of France, where it is shown in gold on a blue field (background). 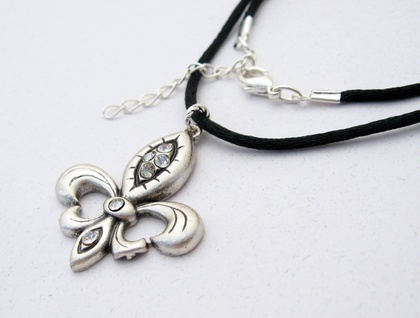 'Fleur-De-Lys Argent' measures 39.8cm, including the lobster-claw clasp, with a further 5.3mm of extension chain. The pendant measures 37mm lengthwise, including the baile (hanging loop), and 32mm across at its widest point.